National surveys conducted by researchers at the University of Michigan and Muhlenberg College before and after Superstorm Sandy explore how personal experiences of weather events affect public perceptions of global warming. 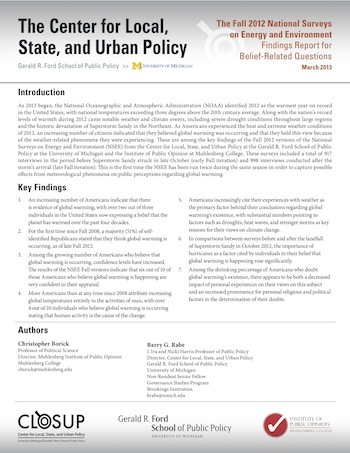 This is the first time the National Surveys on Energy and Environment (NSEE) has been run twice during the same season in order to capture the possible influence of meteorological phenomena on the public's attitudes toward climate change. Americans increasingly cite their experiences with weather as the primary factor behind their conclusions regarding global warming’s existence, with substantial numbers pointing to factors such as droughts, heat waves, and stronger storms as key reasons for their views on climate change. Among the shrinking percentage of Americans who doubt global warming’s existence, there appears to be both a decreased impact of personal experiences on their views on this subject and an increased prominence for personal religious and political factors in the determination of their doubts. Two out of three individuals in the US agree that the planet has warmed over the past four decades. A majority of self- identified Republicans stated that they think global warming is occurring. Among the growing number of Americans who believe that global warming is occurring, confidence levels have increased. More than 4 out of 10 individuals who believe global warming is occurring state that human activity is the cause.